Spend any amount of time in Southeast Asia, and eventually you’ll have to cross the street. Sounds easy enough, but wait until you see your first impenetrable, tangled mass of traffic traveling full speed ahead, coughing up exhaust and dust and soot and all the other nasty concoctions the road throws at you. You’re in for a wild ride. I’m no pro, admittedly, but I have crossed quite a few streets in Asia lately. Here’s several tips I’ve picked up along the way. Motorbikes good, cars bad: Ah, the motorbike with its constant purr advancing on you from all angles. These champion two-wheeled Asian workhorses are highly maneuverable, even when fully loaded with 5 passengers and a 50-pound bag of rice. You shouldn’t worry too much about motorbikes. Cars and trucks…well, those are a different story. Fortunately they are far outnumbered by motorbikes, giving you a fighting chance of successfully crossing the road. But it’s probably safe to say that no car in the history of Southeast Asia has ever politely stopped or slowed down for a pedestrian. The driver may even speed up to avoid having to wait for you to get by. It’s best not to get pancaked, so wait for a small gap in car/truck traffic before crossing. This might be the best look you’ll get. Cross slowly: Your first instinct upon encountering a busy Southeast Asian intersection may be to wait for a sizable gap in traffic (which won’t happen), sprint and weave (which will probably get you killed), or stand paralyzed on the corner while a nice doughnut lady incessantly demands that you purchase her goods (which you should probably consider). No, do not trust your instincts here. Cross as if the street is littered with dog turds, placing one cautious but confident foot in front of the other as you needle your way to safety. Do not succumb to the frightened urge to alter your speed or adjust your course. Slight hiccups in your step will throw a motorbike driver off, potentially causing a chain reaction. Pick a line. Stick to it. Buy another doughnut on the other side. Respect the traffic hierarchy: You, the lowly pedestrian, have little to no traffic clout on the street or even the sidewalk, for that matter. The bigger the vehicle, the more respect it earns. It goes like this: a bus trumps a truck, which trumps a car, which trumps a motorbike. The pedestrian simply gets squashed by all of the above. The bus can basically swerve all over the road at will, just as long as the driver blasts his horn every half second. Trucks, cars, and motorbikes can do the same, just as long as they stick to the hierarchy. Make sense? Listen carefully for those horns. I was spacing out dreaming of bun cha when I got mirrored pretty hard by a car trying to pass me on a narrow street. Hey, he gave me fair warning. My bad. Keep you head on a swivel: Look left. Look right. Look straight ahead. Look behind you. Look a few degrees more to the left. More to the right. You get the idea. I wouldn’t be surprised if a motorbike peeled out of an elevator. Be ready for anything. Traffic lights are merely suggestions: In fact, all traffic signs and laws are merely suggestions. If a red light doesn’t suit a motorbike driver’s schedule in Southeast Asia, he or she pays it no attention and proceeds through the intersection with very little caution. 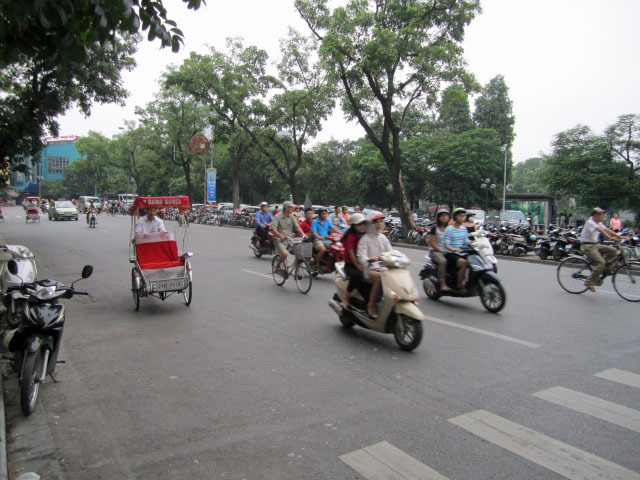 I was sitting shotgun in a taxi in Hanoi just the other day as an old woman blew a light that had turned red 5 seconds earlier resulting in a t-bone collision with another motorbike. Really, crossing the street is not all that bad once you get the hang of doing it a few times. Good luck out there. The most important question, at least in my mind, is what's around the next corner. Who will you meet? Where will you go? What will you do? How will you feel? What will you learn? How will you possibly pack all that crap into one bag? Welcome to my attempt at answering those questions.